In this article, I focus on full hardware virtualization. This refers to the creation of a virtual machine with enough simulated hardware to act like a real computer with its own operating system. In turn, this virtual machine, or virtual guest, is enabled and running on top of a host machine. The software that controls virtualization is called the hypervisor. The hypervisor runs on the host machine. Virtualization typically is used to consolidate hardware servers, reduce energy consumption, simplify server management and ease migration/recovery (in the situation of a failure). It sometimes is accomplished with hardware that needs to be accessed remotely, as the hardware may reside in what may not be a local data center. With that in mind, the hardware's operating system also may be configured without a graphical environment (meaning one that also includes a lack of attached monitor and input devices). This commonly is referred to as running headless. This article assumes that you have Secure Shell or SSH access to what will become the host machine. Prior to configuring the virtual machines, install the appropriate packages from your distribution's package repository. These packages include the libvirt library that provides a simple virtualization API, client-side utilities to access the library and manage the virtual machines, a Python virtual machine installer utility and the userspace components to the kernel-based virtual machine (KVM). Note: libvirt is an open-source API, dæmon and management utility for managing platform virtualization. KVM is a virtualization infrastructure that turns the Linux kernel into a hypervisor. It requires a processor with hardware virtualization extensions. Depending on your distribution, the package names may differ. 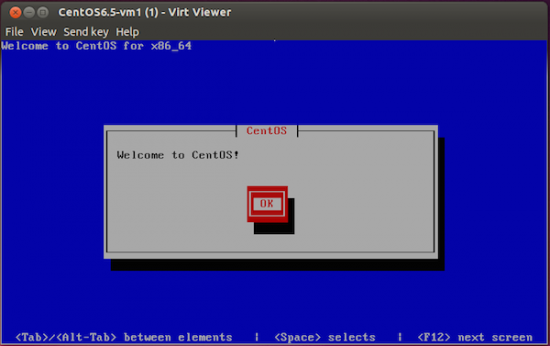 On Red Hat/CentOS, they are labeled as libvirt, libvirt-client, python-virtinst and qemu-kvm. On Debian/Ubuntu, they are labeled as libvirt, libvirt-bin, python-virtinst and qemu-kvm. When the libvirt package is installed, /var/lib/libvirt/ is used as the default location for all virtual machines and related files. If you prefer to relocate this to a more redundant and sometimes external piece of storage hardware, you are welcome to do so. However, for this article, I'm going to continue with the default and place the operating system's installation ISO image in the /var/lib/libvirt/boot/ directory path. With libvirt, virtual machines are defined by a specially formatted XML file. You can read more on this XML format at the libvirt project site. Fortunately enough, you don't have to touch the XML code and can rely on virt-install. The virt-install utility is used to provision new virtual machines and reduce most if not all complications. reconnect to the console to complete the installation process. The --cpu host option optimizes the CPU properties for the VM by exposing the host's CPU's configuration to the guest, while the --hvm option requests the library for the use of full hardware virtualization. The --cdrom option points to the installer disc image, and the --disk option gives the name (with absolute location) and size (in gigabytes) of the virtual disk. The --graphics option allows VNC access to the virtual machine, which will be utilized later in this article. Other supported options include network configuration, boot priorities and more. Note: the virt-install manual page showcases many examples of utility usage and invocation. Once the virtual machine(s) is/are defined, the virsh utility provides the administrator with all the facilities required to manage the virtual machines. The virsh command also is capable of providing the user with domain, network and more details/functionality. Read through the manual page to learn more of these features. Note that this utility also may be launched from the Applications menu in your preferred desktop environment. Also, to toggle the keyboard and mouse capture state to/from the virtual machine, the virt-viewer defaults to the Ctrl-Alt key press. When dealing with such technologies, security becomes an increasingly important topic, and it's advised to share public SSH keys between client nodes accessing the virtual machines on the server. This way, authentication and access can and will be limited only to authorized users and from authorized machines. Another area worth some attention is the firewall and ensuring that iptables allows access over specified ports from specified addresses, denying all else. Connect to the virtual machine and proceed with the operating system's installation process. When completed, the installer will reboot the recently installed operating system, and the CD-ROM image will eject automatically. If you noticed that the virtual machine did not restart and you are unable to reconnect with virt-viewer, using the examples highlighted in the previous section, check that the virtual machine is running. If not, restart it. Your newly installed operating system should boot and run as if it were installed on native hardware. Whether you are running multiple hosted services or virtual clients on limited hardware, or taking advantage of an isolated development environment, hardware virtualization has shown that it is capable of many great things. Run one or more virtual machines on a single server or on multiple servers within a cluster and with high availability enabled. There is no limit to what can be accomplished with few and sometimes limited limited hardware resources.